Kazakh, means “Wanderer” and stan, means “land” and so Kazakhstan means “Wanderers of the land”; aptly named for their centuries old, nomadic lifestyle. Kazakhstan is the ninth largest country in the world by size and the largest, landlocked country. However, it has a very small population in relation to its size, with only about 16 million people. That makes Kazakhstan one of the lowest, population densities in the world, with only six persons per square mile. Kazakhstan is located in Central Asia with a small portion west of the Ural River which is considered Europe. In fact, while standing on the bridge over the Ural, near Atyrau, Kazakhstan, one can have one foot in Asia and another foot in Europe. Her neighbors are Russia to the north, China to the east, the Caspian Sea on her western border and Kyrgyzstan, Uzbekistan, and Turkmenistan to the south. Kazakhstan was formally part of the Soviet Union and one of the last countries to gain independence, which occurred December 16, 1991. The current president, Nursultan Nazarbayev, has been the leader of the country ever since. Run as an Authoritarian Republic, there are concerns regarding human rights violations and suppression of political opposition. Kazakhstan, with its small population, is surprisingly diverse. She is considered a melting pot, in large part due to Stalin’s regime from the 1920s to the 1950s, when Russia deported many different ethnicities to the Gulag camps (involuntary settlements) in Kazakhstan. There are at least 131 different ethnicities living in Kazakhstan. Kazakhs today, make up about 65 percent of the population, which has grown from 40 percent at the time of her independence. The government implements polices and incentives to grow the Kazakh population. Russians make up the second largest portion of the population, although the number of Russians has declined substantially since their independence. There are two official languages, Kazakh and Russian. The Kazakh language is a requirement for all government jobs, as well as many others. It is generally not spoken by Russians. Kazakh is a Turkic language that contains Russian and Arabic words, along with Persian, Mongol and others. It was not written down until the 1860s, using Arabic script. Then in 1940, the Cyrillic alphabet, (used in Russian) along with some extra symbols were used to formally write Kazakh. Many other languages are spoken in the country, especially Ukrainian, German and Uzbek. Muslim is the majority religion but due to the many years of Soviet rule, religion as a whole is not practiced by many. However, just recently, the country has undergone a revitalization of the Muslim religion. Kazakhstan’s main resource is oil, which is plentiful. The land is also rich with many other natural resources. In fact, 99 of the elements listed from Meneleev’s table of “110 chemical elements”, are found there. The country is trying to diversify its economy, to not be so dependent on oil. Kazakhstan fosters a large agricultural sector, featuring livestock and grain. They are working on modernizing their infrastructure and hope to increase their tourism appeal. Environmentally, Kazakhstan has challenges, mainly due to Russia having used an area in northeastern Kazakhstan for testing their nuclear weapons. The amount tested is believed to be the equivalent of 20,000 Hiroshima bombs. The resulting radioactive and toxic waste pose serious health risks for humans and animals. Russia still leases a territory there which houses the Baykonur Cosmodrome (the world’s first and largest, space launch facility) and the lease was renewed until 2050. Kazakhstan has a varied topography. The highest point is Khan Tengri, at a whopping 23,000 feet. The lowest point is located just east of the Caspian Sea, called the Karagiye Depression. It is 433 feet below sea level and considered one of the lowest elevations on earth. The Caspian Sea is home to the country’s navy, (Kazakhstan is one of the few landlocked countries to have a navy.) The Caspian Sea is the largest inland body of water in the world and is rich in sturgeon; a fish prized for its world famous caviar. Most of Kazakhstan is home to what is known as the “steppe” which is mostly flat and barren. It is semi-arid and generally without trees. This area is extremely hot in summer and extremely cold in winter. There are numerous ancient monuments throughout Kazakhstan. One of the most significant is the Golden Man; a Scythian warrior clad in gold armor. Recent excavations suggest Kazakhstan may have been home to the Amazons; a brave tribe of female warriors who fought from the seventh to the third centuries B.C. Some historians believe the Golden Man may very well be an Amazon woman. The country was also significant in the silk trade, as the route went through much of Kazakhstan. Archeologists have found evidence of prehistoric settlements in Kazakhstan dating back to 13,000 BC. Many native Kazakhs likely descended from the Mongol leader, Genghis Khan, as his second son conquered Kazakhstan in the early 1200s. Ancient Kazakhs were the first people in the world to domesticate and ride horses. Horses are very important in the Kazakh culture and are their primary source of meat, along with mutton. Horsemeat is such an important part of the cuisine that athletes, had to beg the Olympic committee, to be allowed to bring it into London for the 2012 games. 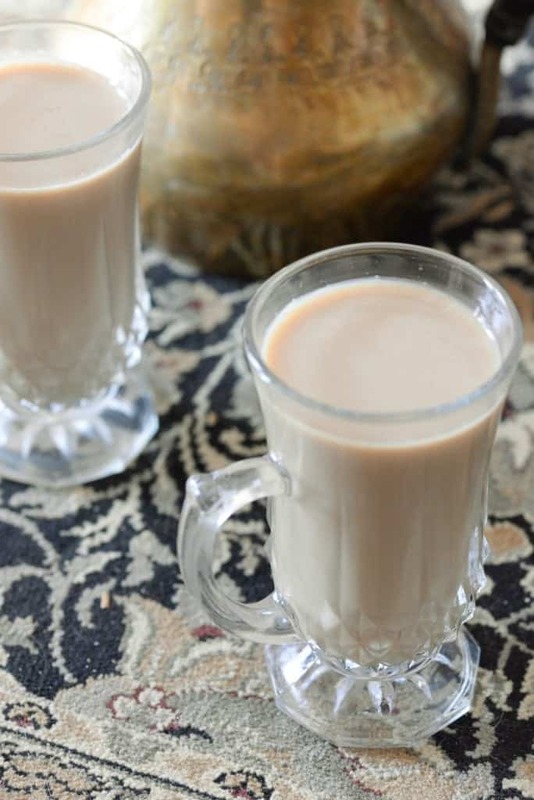 The traditional drink of Kazakhstan is called kumis and sometimes referred to as “milk champagne.” It is made from fermented mare’s milk and believed to be a cure all for everything from a cold to tuberculosis. Kazakhs living on the steppes also drink shubat, which is made from fermented camel’s milk and also believed to have medicinal benefits. Kazakhs like to play several different games on horseback. One is called Kyz Kuu (catch that girl), where a young man pursues a young woman riding in front of him. Her job is to keep him from getting in front of her and she uses a whip to lash at him to keep him at bay. He must persist, and if he does manage to overtake her, she has to reward him with a kiss. Another test of horsemanship is called Kumis Alu (pick up the coin). The goal is for a rider to gallop at top speed and at the same time, pick up a silver coin from the ground. Today a white handkerchief is used instead of the coin. Legend says that Alexander the Great, was so impressed with Kumis Alu that he felt the game could be used to train his own warriors on horseback. As we look into the cuisine of this interesting nation, it is based mostly on the nomadic lifestyle of the Kazakhs, who were herders for hundreds of years. As they traveled, they would set up “yurts” to live in along the way. (This is a domed shaped tent that was easy to set up and move.) The food also had to be easy to prepare and was mostly based on meats (lamb, horse and sometimes beef) combined with dairy and bread. The food contained high fat content to provide energy during their harsh weather. They relied on their animals for transportation, food and clothing. Meat has always been the primary ingredient in the cuisine. It is usually cooked in boiling water and often served in large pieces. Sausages, made of offal and kebabs, are also very popular. They waste no part of the animal. The seasoning is simple; usually just salt and pepper. Milk products are also plentiful, whether made into sour cream, butter or cottage cheese. Manti, a spiced mixture of meat seasoned with black pepper, wrapped in dough and steamed, is also well loved. Tandyr nan is the traditional flat bread, made in the tandoor oven, which accompanies most meals. Chai, or tea, is also served with nearly every meal. We decorated the dastarkhan (which is a clear cloth placed over a rug, or could be just a low table) with a few national symbols. We had a picture of the snow leopard, which lives in the eastern mountains of Kazakhstan and is revered for its bravery, independence and intelligence. Also, the golden eagle, another national symbol that is on their nation’s flag and loved for its power and strength and considered a master of the sky. (Falconry, using this amazing creature, is also very big in Kazakhstan.) We added apples to our décor, as scientists believe the first apple trees grew there as far back as 20 million years ago. 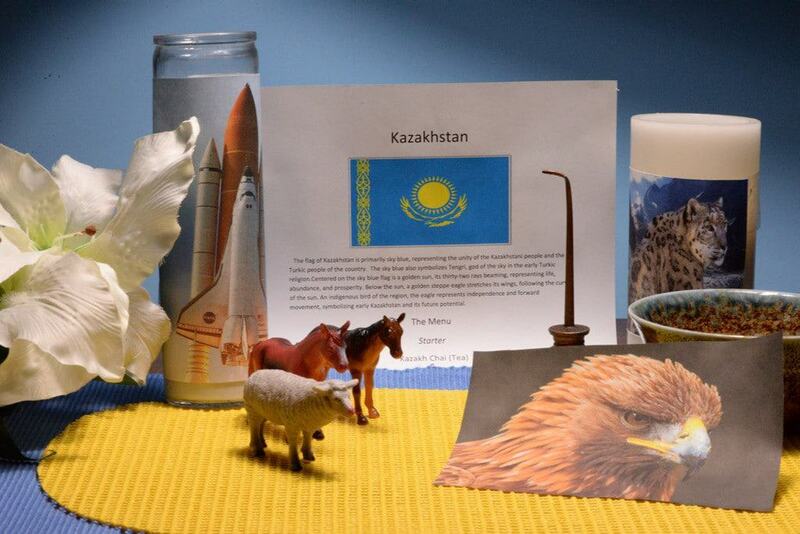 We also put in a few agricultural reminders; a horse and a sheep and a lily, the unofficial flower of Kazakhstan. We removed our shoes before sitting on the floor. We began with some Chai, or tea. It was black tea, spiced with cardamom and fennel and milk and sugar. Typically in a Kazakh home, they will only fill the cup half full. This is to make sure it stays hot and it is actually an insult to fill it all the way, (that means the host wants you to leave.) (Oh please don’t judge the photo as I learned this information after the fact.) Either way, we enjoyed the tea with its unique, earthy flavor. The next part of the meal was served family style; all at the same time. 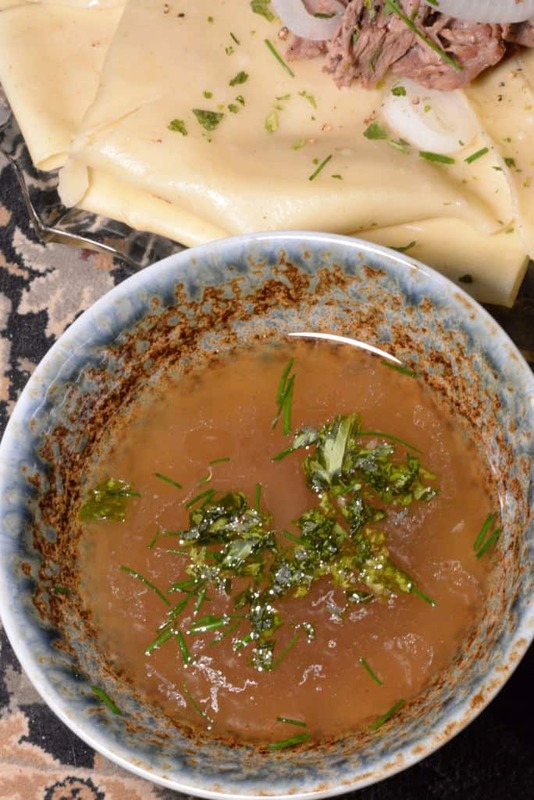 Beshbarmak is probably the most popular dish in Kazakhstan and literally means “five fingers.” That is because the dish is meant to be eaten using all five fingers, of only the right hand. 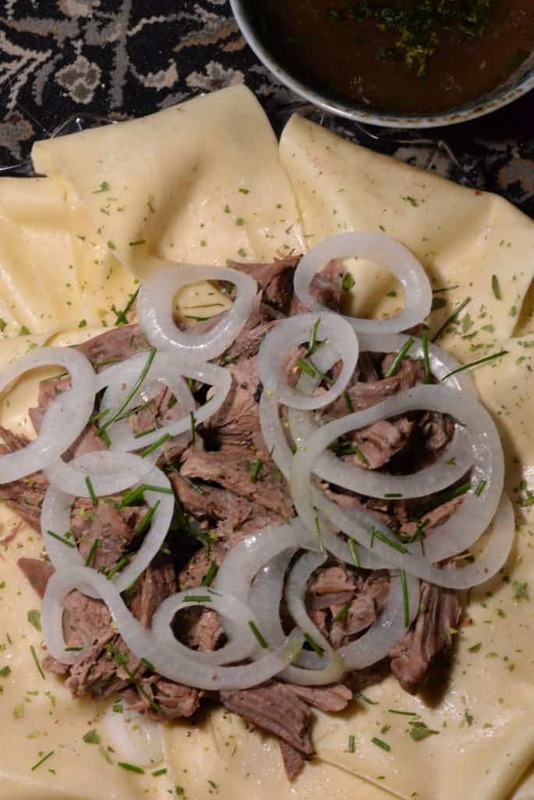 The dish was made with beef, which if cooked in Kazakhstan would more commonly be made with horse or sheep. The meat is boiled until perfectly tender and falling off the bone and then placed on top of large sized noodles, like lasagna noodles. It is then topped with the onions, which were part of the stock. The dish is served with the rich broth that the meat was cooked in but placed in a separate bowl, as a side, called shorpa. It was garnished with chives and parsley. If enjoying this dish in Kazakhstan and you were an invited guest, you may be served the entire sheep’s head, which is a symbol of honor. The host will often serve special pieces to specific people, like ears to children, to listen better and the tongue, to someone who may need a little more eloquence. It all has meaning. We simply savored the flavors of the very tender beef combined with the noodles, onions and broth. 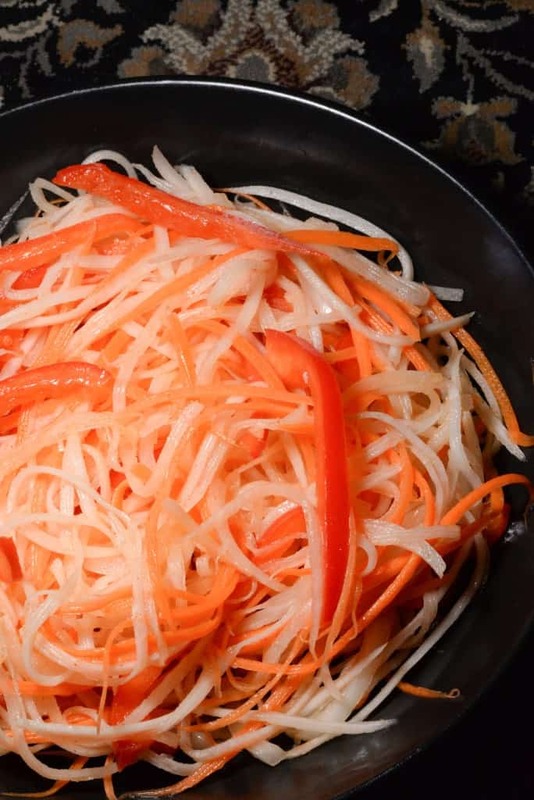 Our main dish was served with a very flavorful, daikon radish salad. They have a very short growing season in Kazakhstan so vegetables, like radishes, carrots and onions are used generously while in season. The salad was delicious, complemented with the sweet and hot flavors of the dressing. 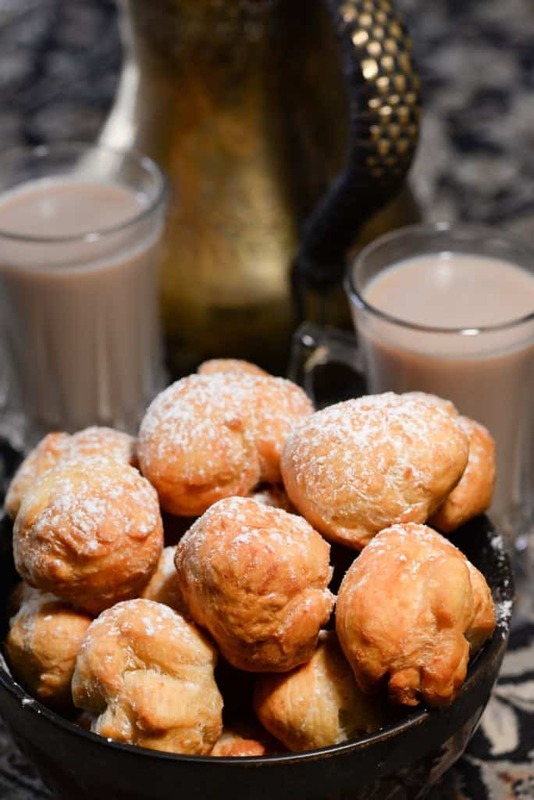 For dessert, we had Baursak; a delicious, fried dough, with a sprinkle of sugar and served with more Chai. This was a simple ending to our fantastic, Kazakhstani meal. Now we are off for some horseback riding, in honor of the Kazakhs’ domestication of the horse. Do not slam shut the door, which is still to be opened. A healthy person values belongings, a sick person values life.